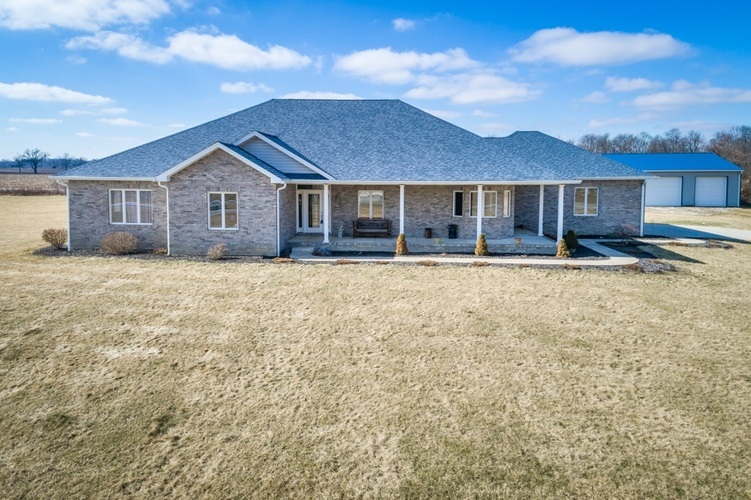 Custom Built in 2006, this one owner home is a treasure sitting on 5.12 acres with endless possibilities that include an outside oasis with an above ground pool, hot tub, and 34x38 pole barn. Don't forget plenty of parking to hold all of your guests. Once you step inside and see the character and charm of this custom design home from the split bedroom floor plan to the open great room/fireplace combo you will fall in love immediately. Kitchen upgrades include cherry cabinets and granite counter tops with a multiple sinks including one in the island. New flooring installed Feb of 2019. New roof on house and barn, gutters, well, heat pump, and furnace all new in 2016. With so many other amenities and updates you will need to see it in person to believe it, including the full basement that is 70 percent finished for the next buyer! The basement finishes includes all rooms studed up, outside walls are insulated, and the plumbing for the full bathroom and the kitchen area have already been completed. Use your imagination to finish off the basement and get ready to start hosting parties every holiday. This home is in the Wapahani School District but still minutes away from the Muncie By- Pass. Don't let this one of a kind, custom built home slip away to another buyer. This is a Must see, and a Must buy!